Its 7 o’clock in the evening, just walked through the door and am starved! Don’t have the energy to make anything grand but not into ordering take-out either. So I open the fridge to find a handful of veggies, greek yogurt and halloumi cheese. Perfect. Dinner will be ready in 10 mins! I always keep a package of halloumi cheese in the fridge, it’s a great vegetarian substitute and it’s perfect on the grill. If you don’t have a BBQ you can always bake these in the oven on about 220C/420F for about 10 mins. 4 wooden skewers, soaked in water so they don’t burn. 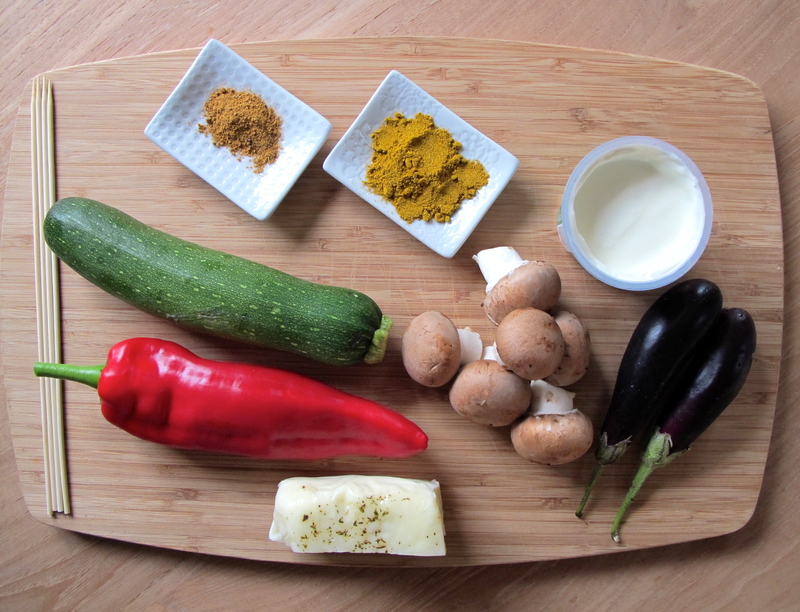 any grill-able veggies you have on hand: for example: 1 zucchini, 1 red pepper, 2 small eggplants, handful of mushrooms. 125g halloumi cheese (there is low-fat available). 1 cup of low-fat organic yogurt. 1 cup basmati rice (rinsed). 1 tsp of freshly grated lemon zest. 1/2 head of red cabbage, sliced thinly to make cole slaw-like strips. drizzle of apple cider vinegar. In a pot, bring 2 cups of water to a boil and then add in the basmati rice. Turn heat to low and simmer for about 10 mins, until all the water is absorbed and the rice is cooked and fluffy. In a medium-sized bowl, add curry powder, minced garlic, and S&p to 1/2 cup of the yogurt, mix well. Chop up your veggies and halloumi into 1 inch pieces. Add veggies and cheese to yogurt mixture and stir well. 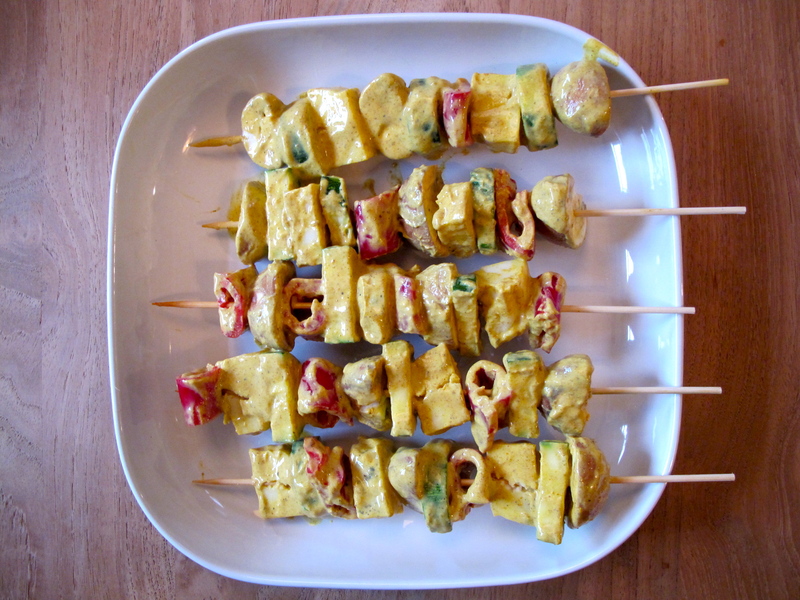 Take your wooden skewers and fit as many veggies and cheese as you can onto each skewer. Grill veggie skewers for about 5 mins (turning after 2-3 mins). Meanwhile add the cumin, s&p to the remaining yogurt. This will be your dipping sauce. Slice the cabbage and drizzle olive oil and apple cider vinegar, add s&p, toss well. 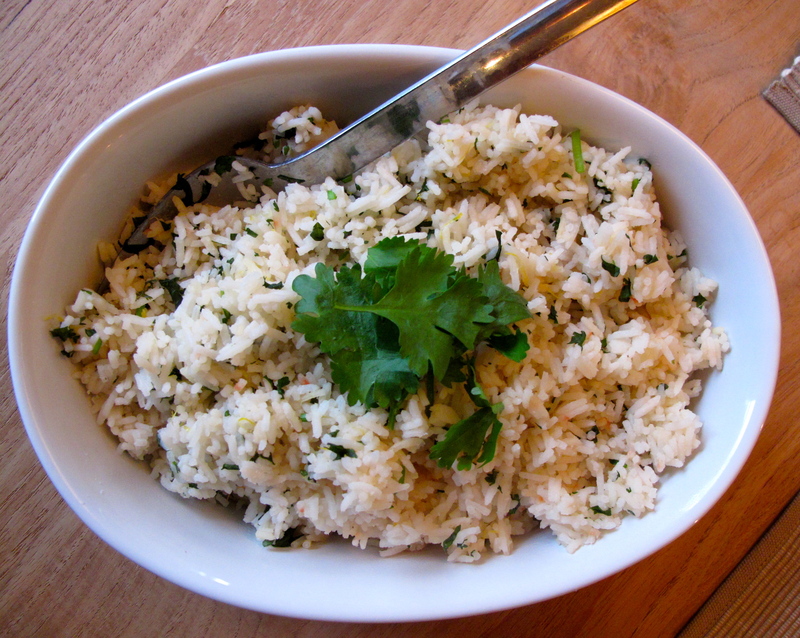 Once the rice is cooked, fluff with a fork and add in the chopped fresh coriander and grated lemon zest. 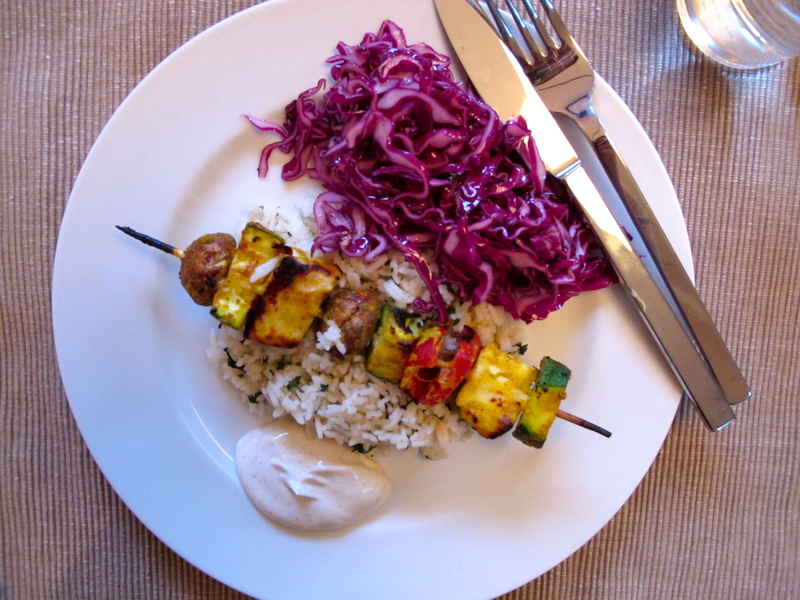 This entry was posted in BBQ, BLOG, RECIPES and tagged bbq, curry, halloumi cheese, healthy, model diet, quick, rice, skewers, veggie on August 21, 2013 by Kelly O'Dell.